I once asked an Italian friend how he got his passata so perfect and whilst gently stirring (and adding a ton of salt) he simply replied, ‘Love’. I’m really starting to believe there’s something in that. I watched the Pizza Man carefully shape the dough, then spread on the passata with absolute precision, seemingly oblivious to the queue. His focus was on making each individual pizza perfect whilst the Pizza Lady timed each firey-bake to perfection. If you wanted to drop out and go over to the Paella stall so be it. 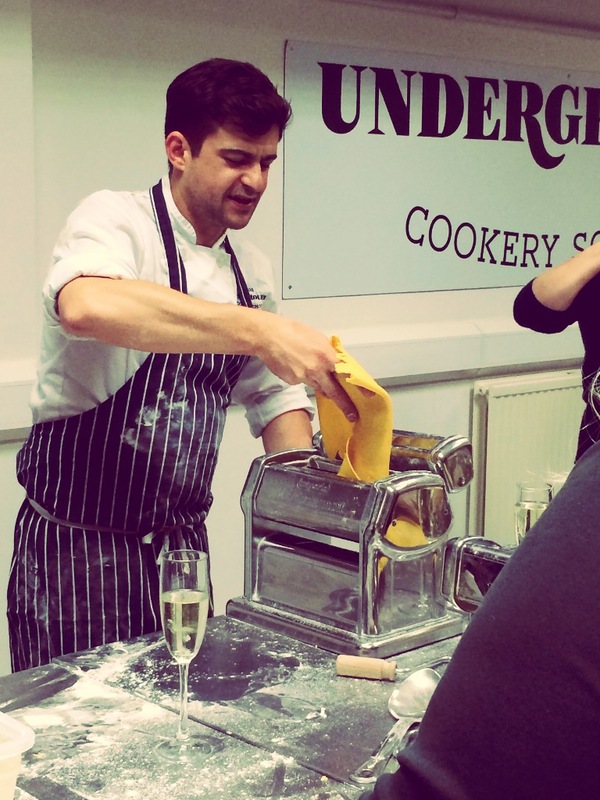 Meeting other bloggers and journalists below stairs at dusk, the menu, devised by Prosciutto di Parma and The Underground Cookery School, could sound like the ultimate romantic interlude or it could equally sound like an internet date from hell. For me, it was the ultimate romantic interlude that, four courses of Parma ham later, left me feeling a tad guilty, that would only be sorted with a cold shower followed by tea and toast for brekkie. But was it worth it? Hell yes. Completely spoilt, we had an aperitivo of Parma Ham, Olives and Parmigiano Reggiano, a starter of Home-made Tagliatelle with White Truffle Dressing topped with Crispy Parma Ham. 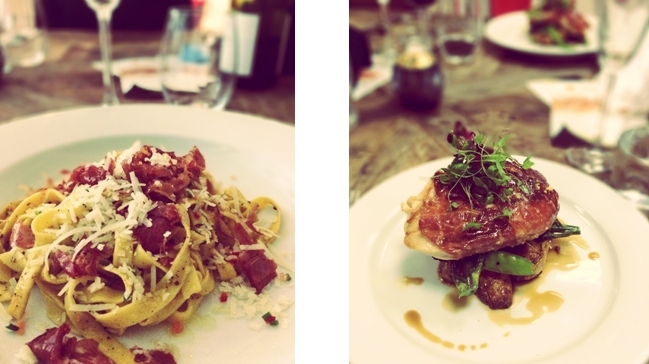 Then came Chicken Wrapped in Parma Ham, stuffed with a Tarragon and Cream Cheese filling. To finish off our Parma ham extravaganza, Meringue roulade with candid Parma ham – half way through which I thought, ‘I should take a pic’, 3/4 of the way through, I’m thinking ‘does this really work?’, 7/8ths gone … ‘I really should have taken a pic -‘but does it work?’ All gone. There’s my answer. Ooops! I didn’t take a picture. I love to eat Parma ham on its own, simply curled into little rosettes or if I’m going retro served with a slice of cool honeydew melon, but for a one-off, never to be spoken about again dalliance this really was an exciting little affair. 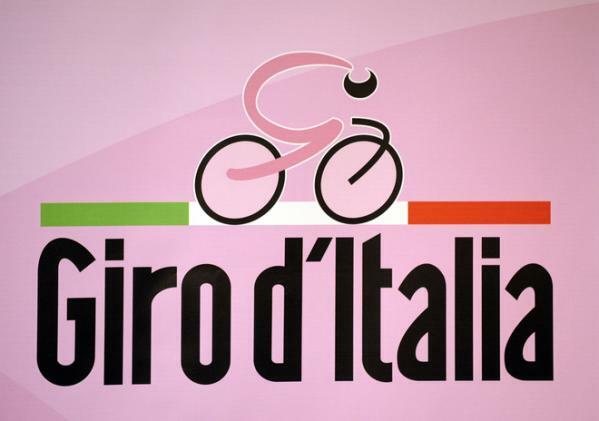 The 3,445.5 km race, Giro d’Italia, starts in Belfast this year. After cyclists finish stage 3 in Dublin, they’ll be boarding a flight to Giovinazzo to complete the 21 stage course across Italy. To mark the start of this exciting event The Stormont Estate will be hosting ‘Go Stormont’ on the 9th May with a fusion of local and Italian food and live entertainment – anyone fortunate enough to go, I’d love to hear all about it!